Water those marigolds! 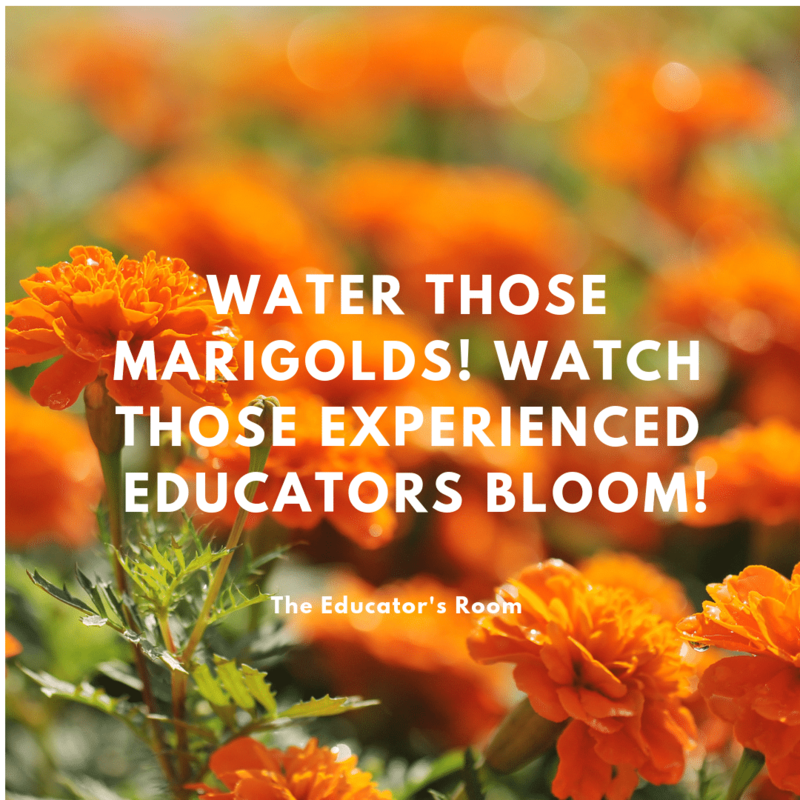 Watch those experienced educators bloom! In 2003, I made a career leap by changing school districts. I had been in a comfortable position, with eight years teaching middle school social studies in a wealthy suburban school. However, I needed a change. I did not want to teach in a single classroom, in one building, investigating a particular topic for thirty-four years. I felt stuck. Fast forward sixteen years, I realize that I had many choices in 2003. I was young, malleable, and based on most school district’s pay scales, I was cheap. I had not, however, reached my full potential. Ultimately, I am glad that I decided to take a risk. My current employer has offered me excellent professional development, more financial opportunities, a rich, diverse student body, and most importantly amazing colleagues. The teachers I work with demonstrate a passion for learning and compassion for students. I found a great place to work. And yet, recently I feel the familiar sensation of quicksand–I am feeling stuck again. However, today I have company–other veteran teachers are in the pit with me. Every time we try to climb out we feel pushed back down. Jennifer Gonzalez from the Cult of Pedagogy Blog wrote a directive to new teachers entitled: “Find Your Marigold: The One Essential Rule For New Teachers.” Although her piece focused on new teachers, her message is true for all educators–finding colleagues that inspire and help you be your best is rare and precious. Gonzalez writes: “By finding the positive, supportive, energetic teachers in your school and sticking close to them, you can improve your job satisfaction more than with any other strategy. And your chances of excelling in this field will skyrocket. Just like a young seedling growing in a garden, thriving in your first year depends largely on who you plant yourself next to.” I have been so fortunate to plant myself next to dynamic, positive teachers who after twenty plus years in the profession, continue to love students and strive to be their best. When I started teaching in my current school, departments were led by strong, outspoken guardians of the profession. These people were not always popular, but they had integrity. These leaders respected best practices, shared freely, and encouraged department members to flourish. These teachers led book clubs and professional development sessions. These colleagues became my marigolds, introducing me to a flourishing garden of beautiful, vibrant flowers. Unfortunately, over the years, these flowers have been neglected. Even though these individuals continue to be dynamic teachers, they have wilted. Each time they have trained younger educators in the role of their superior, their flowers have browned. They have grown tired of unfunded government mandates, and fly by night initiatives from a revolving door of administrators. Regardless of ridicule or chastisement, these teachers persist in protecting students and the teaching profession. Like a bird trying to fly into a glass window, they repeatedly try to right the ship, only to be rewarded with a migraine headache. Or worse, they are told by their supervisors that of course, they are respected, talented, and well prepared, but not what we are looking for in an instructional coach, a department chair, an assistant administrator, or even a summer school instructor. Teachers with experience have a wealth of untapped potential. However, do not be surprised if they are a bit ragged around the edges. These people might seem closed, but all they need is the opportunity to share their expertise. Veteran teachers need new avenues in which to explore their talents. All any savvy administrator needs to do is give their marigolds fertilizer, sunshine, and water. When veteran teachers get support, they help the entire system bloom.